James and Christie Fruits and their 3 children, Malachi, Mylee, and Max, are known as the Fruits5. Malachi (17) divides his time between academic and music classes the local college and high school. Mylee (17 and twin to Malachi) has Cystic Fibrosis and is a bona-fide fighter for her own health while taking high school classes and participating in a nursing program. Max (13) divides his time between school and playing video games with his friends. James is self-employed, and Christie keeps the family running. 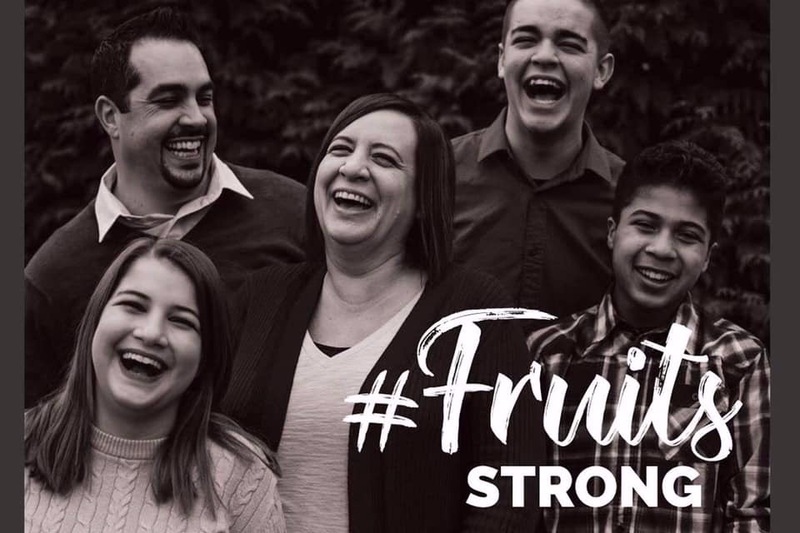 The Fruits5 are a close knit family that love laughter, fun, and Jesus. The are well know for their loving energy and selfless service to others. On January 21st, James and Christie Fruits went to urgent care for what Christie thought was a kidney infection. Unfortunately, she was admitted to the hospital on the Cancer Care floor. During the invasive surgery they did not find what they were expecting. Instead of a few masses, the doctors removed over four dozen masses of varying sizes. The biopsies of the masses revealed that Christie has two cancers- ovarian and endometrial. Although the surgery was a great success, cancer cells remain and chemo is absolutely necessary. The doctors used words like “aggressive cancer” upon review of the pathology. Now is the time to fight! On Tuesday, March 5th, Christie starts her first round of chemo, where she will receive rounds of treatment every 21 days until late June. Next steps of treatment will follow based on the success of the chemo. Just after Christie’s surgery, Mylee was also hospitalized. With Mylee’s condition as a Cystic Fibrosis fighter, she is regularly hospitalized to fight off any infection and do aggressive treatments. This is of concern as Christie has stayed in the hospital with Mylee 24/7, advocating for her, caring for her, and keeping her company. Christie will not be able to do that while she is undergoing chemo treatments due to her compromised immune system. James and Christie initially resisted the idea of a GoFundMe campaign, because people do so much for them to support their family anytime Mylee is hospitalized and people also give generously to their Cystic Fibrosis Foundation fundraising efforts. Friends, we have reassured the Fruits that they have done so much for others and now is time to let others do for them. The medical bills will be substantial. This campaign will help with medical bills and expenses associated with Christie’s treatments on her journey back to health. Please join us as we band together around this loving family to support them in their time of need. Although we can’t take away their challenge as they together fight this fight, we can ease the financial burden. We ask that you reach deep to help this effort to support our dear friends. The Fruits family are believers in prayer and appreciate your prayer for healing for Christie, and for the cancer not to come back. Please also pray for healing for Mylee, a cure for Cystic Fibrosis, and for Mylee to not be hospitalized during Christie’s chemo treatments. Thank you for joining us in prayer for them and for your support of this campaign. Starting March 11th, to keep up with the Fruits5 and streamline communication, they will be updating their blog page at www.fruits5.com. It won’t be short of entertainment as they are pretty open and transparent about the crazy fun things that happen in their lives. Christie started her first chemo cycle (1 day every 21 days) on March 5th. The first week was rough. She was in pain and got hives due to a possible allergic reaction to the chemo. The past two-ish weeks have been good! She feels stronger than she has felt in a long time is enjoying doing some normal activities. March 26th starts cycle 2. This is met with a bit of anxiety. But they all feel a little more prepared on how to fight the pain. This whole process takes a toll on everyone in different ways. James and Christie are working hard to walk the kids through this while figuring out how best to walk through this themselves. They are reminded time and time again that they are not alone in this fight. They are so grateful for everyone who has come alongside of them to cheer them on, hold them up, and jump into the fray with them and pray for and with them. God’s fierce love for them is evident in the army he has surrounded them with. Please keep the prayers coming and also supporting by sharing this GoFundMe to help raise funds to take off some of the financial pressure. To keep up with the Fruits5 and streamline communication, they will be updating their blog page at www.fruits5.com, staring on March 11th. You won’t be short of entertainment as they are pretty open and transparent about the crazy fun things that happen in their lives.